The 2019 Nissan Titan XD is a beefy and popular full-size pickup truck. 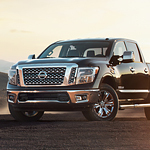 While the Nissan Titan XD looks slick enough to grace any city street, it also includes many features that are designed to help business owners and others to get the most out of their efforts. The Nissan Titan XD cargo bay is particularly well-stocked with driver assistive features. These features include special high durability bed liners as well as bed extenders. The 2019 Nissan Titan XD has a generously sized bed, but it also includes a liner with many unique features. This factory installed piece of technology comes equipped with a surface that is designed to maximize traction and minimize slipping, thus improving operator safety. In addition to protecting drivers and passengers, it also protects the vehicle from rust with its moisture wicking high rib orientation. In addition to offering protective features, the 2019 Nissan Titan XD also allows drivers to carry extra-long cargo with its tailgate extender. This extender lets drivers lay down the rear gate to extend the bed, and it also offers a special high-strength cargo cage that makes a hearty and worthy substitute for the gate itself. This extending gate is also completely adjustable and can store flush against the cab of the vehicle.